If your New Year's resolution this year is to find ways to save, a good place to start is researching how to save water using a sprinkler system. Sprinkler systems can be expensive, and we all know they require and use A TON of water every month. Let me share some ways that you can save water, but still use a Sprinkler System. Because as inefficient as they may be, sprinkler systems are terribly convenient and are practically a standard among the majority of homes today. It is vital that you understand that not everyone of your sprinkler stations or sprinkler zones should be treated the exact same. Some zones are bigger than others, some are probably shaded for longer parts of the day than others, and some might require little to no watering at all. Additionally, some zones should be watered via bubblers, others with Pop-Up Sprinklers, and some, with a Drip System. Remember, control your sprinkler timer, DO NOT let it control YOU! With a Four Station Sprinkler Timer, you have the option to run Station 1 for 15 minutes, Station 2 for 5 minutes, Station 3 for 10 minutes, and Station 4 for 1 minute! It's up to you. And in the case of most lawn, each station should not be getting watered for the same amount of time. Pay attention to which, if any, zones get shaded during the day. Some watering stations are probably closer to your house or directly under a tree. These stations require less water than stations that are exposed to the sun all day. A few things about Zone sizes to help you save water effectively while still using an Automatic Sprinkler System. 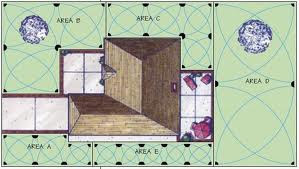 The size of your zone will determine the type of sprinklers you have operating within that zone. I'll illustrate my point using a table because, well, I love tables. All the sprinkler heads in one zone should be similar! Try not to mix and match. You shouldn't have a gear drive pop-up sprinkler head and a bubbler in the same zone. Make sense? I see perfectly good sprinkler water running down the road or puddled up on driveways all the time. Watering the road is not going to do your lawn or your wallet any good. Here are some tips to keeping the precious water soaked up in your grass. I know I already mentioned that you could and should be using a Drip System for your smaller stations or zones, but I wanted to re illiterate this point. Think about how much water is lost to evaporation, mist, and over-spray when you water your lawn using regular sprinkler heads. Some of those sprinklers shoot the water 5-7 feet in the air before it's supposed to land on your thirsty grass. What happens when it's windy? 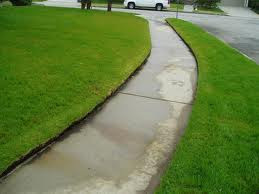 Your driveway ends up getting 20-35% of the water that your grass should be getting. That is a lot of water down the drain. Drip Irrigation systems eliminate the problem of losing water to evaporation, mist, or over-spray. Granted, watering an entire lawn with a drip irrigation system is a bit extreme, but there are many times when people could be using a drip irrigation system and are using a lawn sprinkler or the like. For gardens, plants, flowerbeds, and small zones, do consider a Drip Irrigation System. 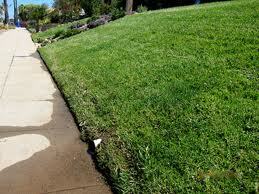 Avoiding "Run-Off" Watering - Be mindful of SLOPES! 1) Kill two birds with one stone and plant some shrubs or other plants at the bottom of your lawn so when that excess water heads for the road, you've got some plants there that will put that water to good use. 3) Or, again, you could consider a Drip System. The run-off might all be coming from the bottom-most zone. If possible, switch out the sprinkler heads for a Drip System so the water has no choice but to soak right into the soil. But I would try options 1 or 2 first. 4) If you don't want to water your lawn twice a day and don't have any place at the bottom of your lawn for a new row of plants, how about planting a tree? A nice big tree could provide shade for your bottom zone which will allow you to water it for less time, which will keep extra water from running off. If you don't know what it is, I did a post on Xeriscaping a while back. Basically, a xeriscape is a landscape consisting of stuff that doesn't require water [rocks]. I'm not suggesting you get rid of all your lush grass and plants, but maybe cutting back in an area or two won't hurt. You could save water by condensing your lawn and putting in a gravel border or a few rock "islands" here and there. The renovation might cost you more than you would end up saving, but it's definitely something to consider. :) Plan it out, crunch the numbers, and make an educated decision. Rain sensors are undeniably convenient and ingenious! Rain sensors absorb water to relay information for shutting off an automatic sprinkler system when it rains or there are freezing temperatures. So instead of you having to remember to flip your sprinkler system on and off when things get cloudy, a rain sensor does it for you. Hopefully one or more of these ways to save water with a Sprinkler System works out for you. I've seen so many sprinkler systems that waste a ton of water. Broken sprinklers that spew water everywhere it's a huge problem.